8 express keys on the left and 16 soft keys on the top of the drawing tablet's surface, can be configured and customized to any combination keys you want to realize the function without keyboards, and will raise your work's efficiency. 10 * 6.25in active area, very large writing area. 5080 LPI resolution and 233 RPS report rate. 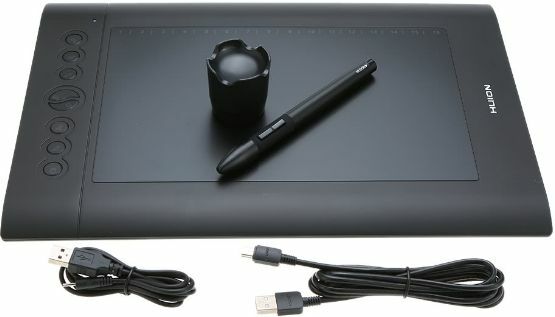 2048 levels pressure sensitivity makes your drawing lines smoother and gives you a natural feeling when you drawing. 0.6in ultrathin thickness, ergonomic and slim tablet design, portable and convenient to carry it to anywhere you want. Comes with a rechargeable pen, lightweight(only 14g) and comfortable to hold, can be continuously used for 800 hours when fully charged. The pen with auto sleeping function, will save power, very economical and environmental. Direct pointing: you can move the cursor to any location on the screen by hovering the digital pen tip over the tablet's surface, and you can use the digital pen draw on the tablet like a real drawing pen on paper. System requirement: for Windows Vista/XP/7/8 or for MAC 10.4.0 or later. Available USB port, CD-ROM driver or Internet connection to download the driver and manual. Compatible softwares, such as: for Corel Painter/CorelDraw/Adobe Photoshop/Adobe Illustrator/Adobe Fireworks/Macromedia Flash/ComicStudio/SAI/ Infinite Stratos/3D MAX/Autodesk MAYA/Pixologic ZBrushand/sketchbook and so on. It is great. You can scribble on screen shots and conduct lessons on line.